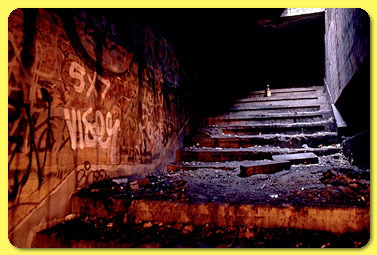 Tour of 91st Street or City Hall station, with stairs and graffiti. Between 1982 and 1996 the New York City Transit Authority spent 13 billion dollars to reverse decades of decay in the subway. Air conditioning was restored, trains travelled ten times as far between breakdowns and graffiti disappeared. Stricter law enforcement has cut felonies by two-thirds.